A great thing about Buenos Aires is that it has some really fun and interesting suburbs. I recently visited one of them, El Tigre. Going by train, it took us just about 1 hour to reach Tigre from Belgrano Station. 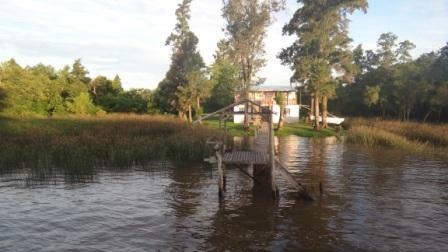 El Tigre is situated near the Rio de la Plata and consists of many small islands. It’s a popular destination for tourists as well as residents of Buenos Aires. One of the main attractions of Tigre is the local market where you can find anything from Mate cups, to leather goods and souvenirs. After strolling around the market for a while, we walked through the streets of El Tigre, which were very quiet and empty. 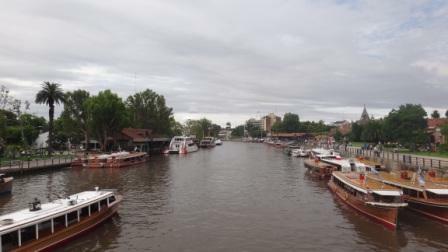 Probably the major tourist attractions of Tigre are the boat rides that take you around the little islands. So we decided to take on of those boats in the evening to be able to watch the sunset from the boat. The boat tour started by going through little islands with holiday houses on them and some of them were really beautiful. Then, as the sun started to set, the boat went to a broader part of the river and from there we were able to briefly see the skyline of Buenos Aires. 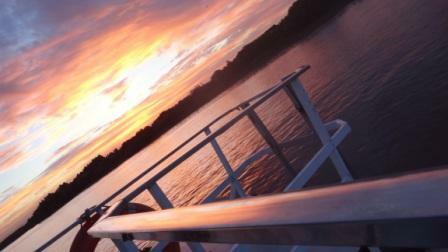 The sunset that followed was truly mind-blowing, especially in this scenery of little islands and almost untouched subtropical nature. After our boat ride, we ended our stay in Tigre by having a delicious parilla (barbeque) at one the small restaurants and then took the last train back at 21:15.El Tigre might not be the most exciting place in the world but its definitely worth going for a day trip, and a boat ride at sunset is something I’d highly recommend to anyone visiting Buenos Aires.